ST. GEORGE — Domestic violence-related deaths have accounted for 42 percent of Utah homicides for the last 16 years, and 2017 has already surpassed the 2016 statistics. So far this year, 28 people have died in domestic violence-related homicides in Utah, six more than last year. 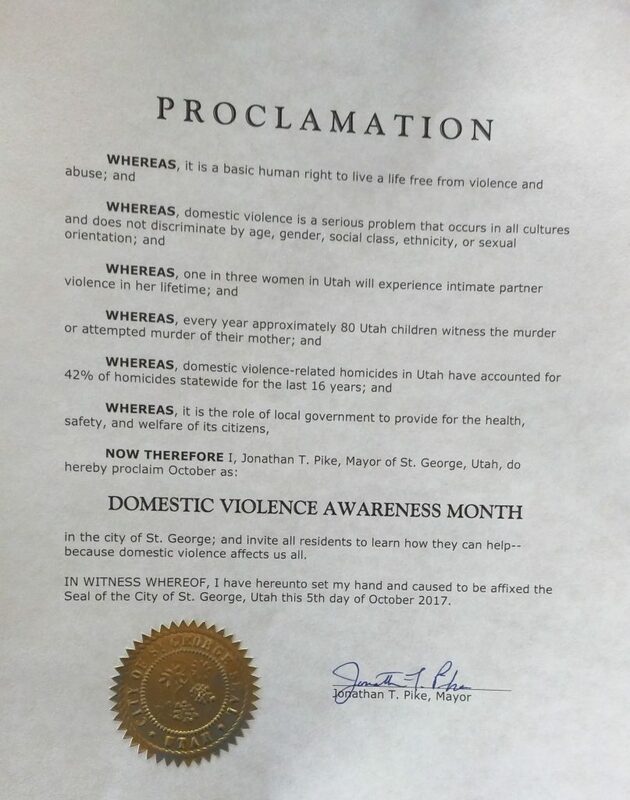 St. George Mayor Jon Pike said he hopes increased awareness of domestic violence and intimate partner violence will translate into action. It is a basic human right to live a life free from violence and abuse. Domestic violence is a serious problem that occurs in all cultures and does not discriminate by age, gender, social class, ethnicity or sexual orientation. One in three women in Utah will experience intimate partner violence in her lifetime. Every year approximately 80 children witness the murder or attempted murder of their mother. Domestic violence-related homicides in Utah have accounted for 42 percent of homicides statewide for the last 16 years. It is the role of local government to provide for the health, safety and welfare of it citizens. 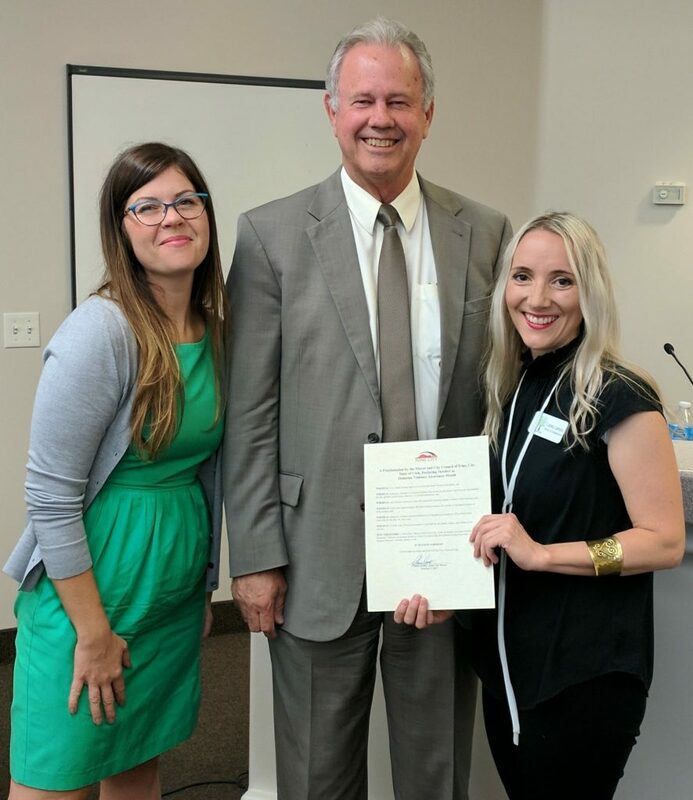 Representatives from the St. George-based Dove Center accepted signed proclamations from Pike and Ivins Mayor Chris Hart during the cities’ respective City Council meetings. The Dove Center is a nonprofit organization that works to empower survivors of domestic violence and sexual assault through education and resources to increase safety and promote healing from trauma. 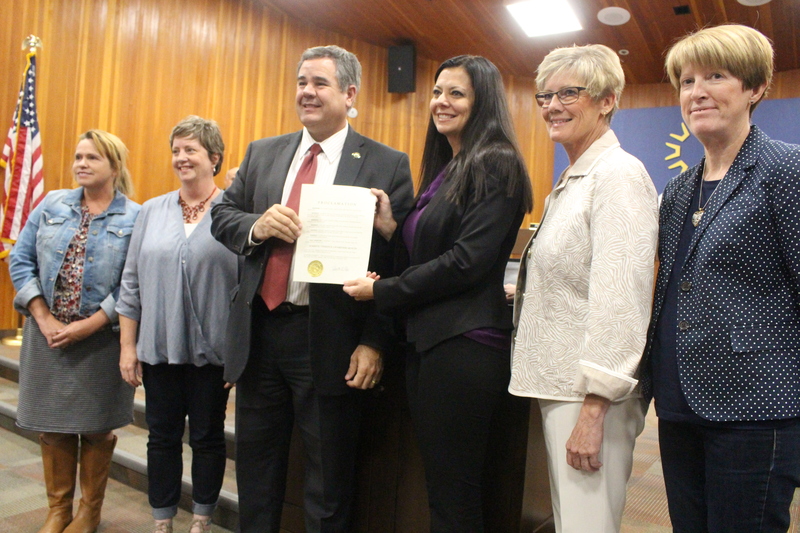 The center is working with other organizations to help spread the word about domestic violence through a variety of events and programs. One such program is the Allstate Foundation’s “Purple Purse Challenge,” a fundraiser working with community partners to help provide financial support to abuse victims. According to the Allstate Foundation, the No. 1 reason domestic violence survivors either stay in or return to an abusive relationship is that they don’t have the financial resources to break free. Donations to the Purple Purse Challenge will go toward providing women with the resources to buy food, provide childcare, receive counseling, rebuild credit and obtain transportation. 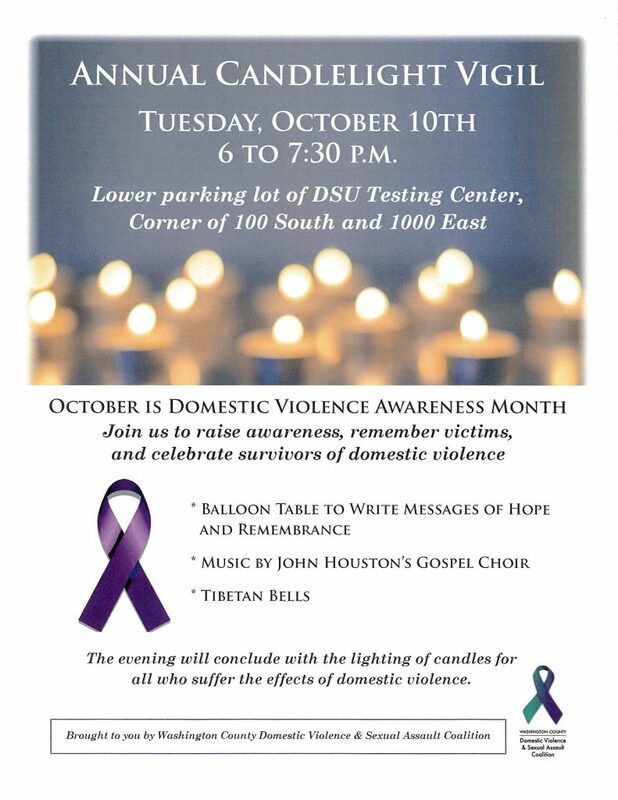 As another part of awareness efforts, the Dove Center will also be participating in a candlelight vigil hosted by the Washington County Domestic Violence and Sexual Assault Coalition in St. George Tuesday evening on the Dixie State University campus in a show of support for families affected by domestic violence. What: Domestic Violence Awareness Month candlelight vigil. When: Tuesday, Oct. 10, at 6 p.m.
Where: Dixie State University Testing Center lower parking lot, 100 S. 1000 East, St. George. Allstate Foundation Purple Purse Challenge website.